Over two thousand years ago Ephesus was a thriving center of Hellenic civilization. Fifty years after Christ’s death it evolved into a vital hub for the budding Christianity movement. By 100 AD Ephesus became the largest Asian city in the Roman Empire with an estimated 500,000 residents. Its glory days dried up quite literally when built-up silt from a river caused the city to lose its profitable harbor on the Aegean Sea. Earthquakes and foreign sackings in the Byzantine era contributed to its demise. Today, however, the glory is back, with over two million tourists descending on Ephesus to view the finest restoration of Greco-Roman ruins in the Eastern Mediterranean. Traveling for two weeks with my sister Cat, our journey on Turkey’s west coast started at Selcuk (sel-CHOUK) even though guidebooks warned us of its overly touristy reputation due to its proximity to Ephesus. We landed at Izmir Airport (from Cappadocia) at dusk, picked up the rental car, and drove an hour south to reach Selcuk. We could have spent the night in the nearby Greek village of Sirince, reportedly very cute and quaint, but we figured our arrival would have been too late to appreciate it and next day’s schedule was reserved full time for antiquities. Weeks in advance I had reserved one double room for one night at a hotel with positive Trip Advisor reviews. Hotel Bella suited our purposes because it was within walking distance of Selcuk’s local sites and its décor had an authentic flair. We parked across the street about 8:00 pm whereupon an enthusiastic employee came to our car to transfer our luggage inside. Great, we thought, they’re expecting us. The manager, typing on a keyboard, inquired for a last name, then asked ominously, “Did you make a reservation?” After some searching, she finds the email in which her colleague had confirmed our reservation but then announces “Sorry, we’re all booked up.” Whoa! She got flustered and blurted out that they would find us a place to stay and “of course” pay for it, plus dinner on the house and we could come to Bella for breakfast, too. I said OK (mistakes happen) but then somewhere along the line the comped room was withdrawn. There are those who would have made a stink but we let it slide even though the alternate hotel was charmless. Nonetheless, Cat and I returned for dinner in a buoyant mood which then pretty much got deflated when we were made to feel like free loading interlopers. Whatever. Selcuk’s stellar archaeology more than made up for this brush with petty mediocrity. At 8:00 am Cat and I were the first to enter the Basilica of St. John the Baptist, the site where the apostle is believed to be buried. When St. John fled Jerusalem he settled in Ephesus and wrote his gospels. In the 4th century a chapel was built over his tomb and two centuries later an enormous cathedral was erected. In medieval times pilgrims flocked to the tomb believing St. John performed miracles. Destroyed by an earthquake in the 14th century, only a fraction of the cathedral has been restored, but its former grandeur shaped as a cross with six domes is not hard to imagine. We roamed the grounds for a good half hour marveling at the cryptic Byzantine carvings in marble. My intent was to take a quick ten minute look at the two sumptuous statues of Artemis before heading to Ephesus ruins. But before we could reach the Hall of Artemis, we found ourselves inching along utterly beholden to the splendid artifacts before us, like the 3rd century fresco of Socrates and the bronze Eros on a dolphin. 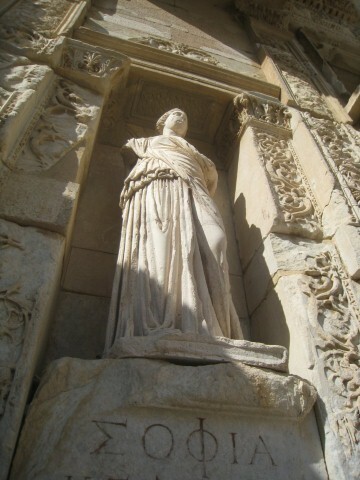 During the Ottoman Empire, many of Ephesus’ great works of art were appropriated by the British, then the Austrians, until removals were forbidden by Turkey when it became a republic in 1922. Now at least some of the Ephesus patrimony is on display, not in Europe, but at its origins in the Selcuk museum. Our ten minutes turned into a very gratifying hour or two and I realized that the museum serves as a superb orientation prelude to the archaeology site. I was daft to think ten minutes would suffice in the Hall of Artemis. Any tourist unimpressed by the museum’s Artemis statues has no business traveling to this part of the world. With her two dozen plump breasts, the nine foot tall white marble Artemis still commands awe as the epitome of a powerful fertility goddess. The cult of Artemis was the whole raison d’être of Ephesus with worshippers gravitating to the area as early as the 10th century BC. The mighty Temple of Artemis, built and rebuilt over the centuries, was as central to Ephesus as the Vatican is to Rome. We walked outside the museum to gaze at the temple’s one lonely column which depending on the season is sometimes crowned with a stork’s nest. A single column is all that stands after fire and earthquakes destroyed the temple’s other 126 columns that towered fifty-seven feet high. It is hard to believe that the Temple of Artemis, today a forlorn site submerged in a swamp, was once ranked as one of the Seven Wonders of the Ancient World. After spending the morning in Seluck we were eager to get to Ephesus, keenly aware that this World Heritage Site (tentatively listed) merits a full day. 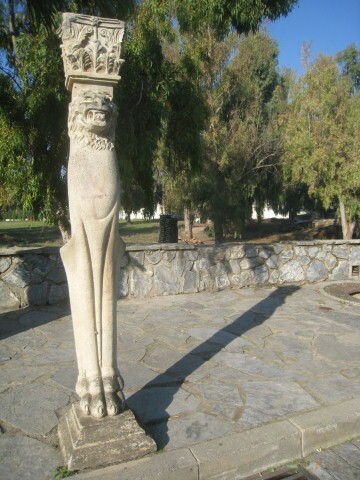 On the Selcuk-Ephasus road as Cat drove I gaped at a series of ten-foot high white stone statues of tall skinny fiercely roaring lions as erect as Buckingham Palace guards. They stood roughly every thirty feet or so for a good half mile. Do the math – that amounts to about eighty statues lining the route. In other cities, a procession of ancient lion statues would be featured prominently in local travel brochures, but Ephesus and Selcuk have so many riches that these striking sculptures do not even rate a footnote in guidebooks. When Ephesus had a harbor, it was one of the three entrances to the city. 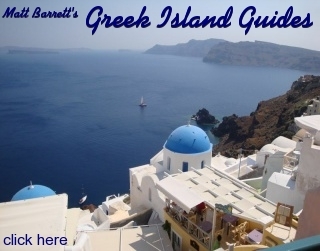 Today, since most folks groan at walking uphill, tour buses or taxis arrange to drop their clients off at the western Koressos Gate where they proceed downhill through the archaeology site to the eastern Magnesian Gate and rendezvous with their ride. To get a modicum of exercise, and just being contrarians in general, my sister and I entered the ruins from the Magnesian Gate and had no qualms walking uphill to the Koressos Gate. The walk back took us about twenty minutes non-stop. 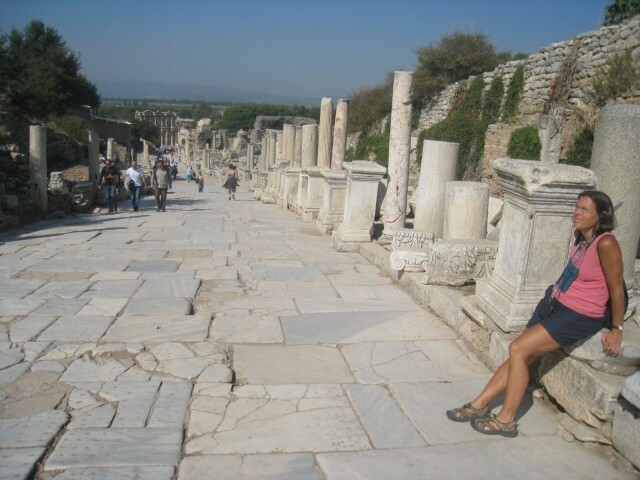 Ephesus is user friendly in that almost all points of interest (theatre, stadium, baths, etc.) lie to the right or left side off the main thoroughfare. In this set-up you are less apt to get lost or wonder which direction to go. 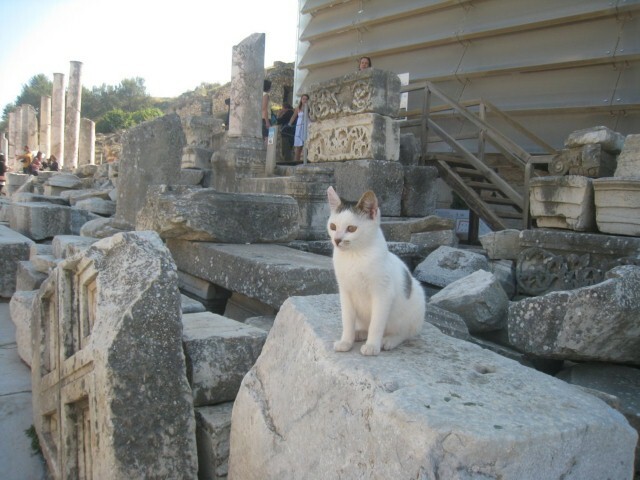 Although Cat and I would have liked our own personal guide, we probably would have exhausted him or her because we wanted to see everything at Ephesus and guides tend to just show you the highlights. We had a triple approach to educating ourselves: we rented audio tapes at the entry gate and relied on the extensive descriptions in our Turkey Lonely Planet plus the site’s excellent signage. Ephesus seems humongous and yet only ten percent of the grounds have been excavated. Austrians, who have been digging in Ephesus since 1893, are the primary Europeans archaeologists involved in and funding Ephesus’ perpetual restoration program. 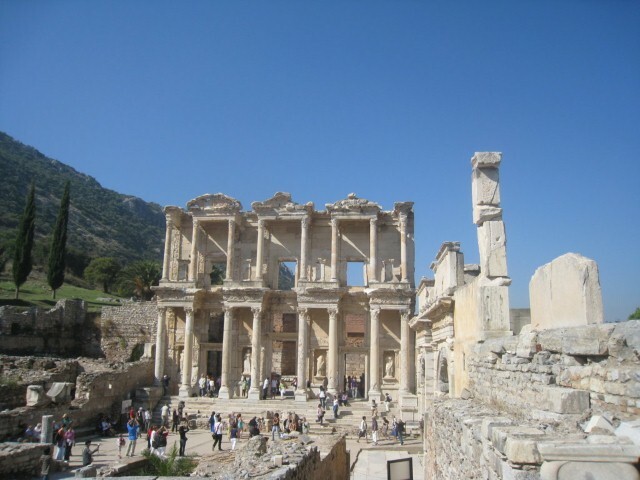 A small tome would be needed to describe the three dozen plus ruins at Ephesus. Bowing to brevity, I reluctantly highlight a few. The most celebrated reconstruction in Ephesus is the Celsus Library named for a Roman emperor buried beneath the ground floor. This radiant building held over 12,000 manuscripts, almost rivaling the famous library in Alexandria, Egypt. The scrolls were kept in niches in doubled walls to protect them from humidity. The library’s stunning two story Corinthian columned façade is Ephesus’ signature image on postcards and websites. It lies right at the “L” intersection where the two main thoroughfares converge about equidistant from both eastern and western gates. As a halfway point it makes a logical rest spot but that also means you can never get a photo of the library without sight seers in the shot. Named not for academic pursuits but rather after the surname of a rich Christian woman, the Scholastica Bathhouse was once three stories high and had the typical four rooms customers sequentially followed: dressing room, cold water room, warm water room and finally the hot thermal waters room. The baths were a place to socialize, gossip and discuss the issues of the day. Next to the baths is the latrine area where users sat against the wall on round toilet seats and assumedly continued their conversations in leisure since there were no partitions between the seats. Two of the six houses have been combined to enable viewers to glimpse inside the homes of wealthy citizens. We paid the additional entry fee and got to see beautiful exquisite mosaic floors and fresco walls. This area is protected by a gargantuan awning and as you amble along the upper platform walkways you can look down and witness real archaeologists at work at several dozen long tables. They were deep in concentration piecing together thousands of mindboggling fragments as if they were contestants in the world’s largest jigsaw puzzle tournament. As its name implies this major walkway, dating from the first century AD, is laid entirely of marble slabs. They are broken up here and there but still smooth enough that a person in a wheelchair could make their way through Ephesus easily enough. One of the marble slabs is embedded with a most curious drawing of a footprint and a heart. 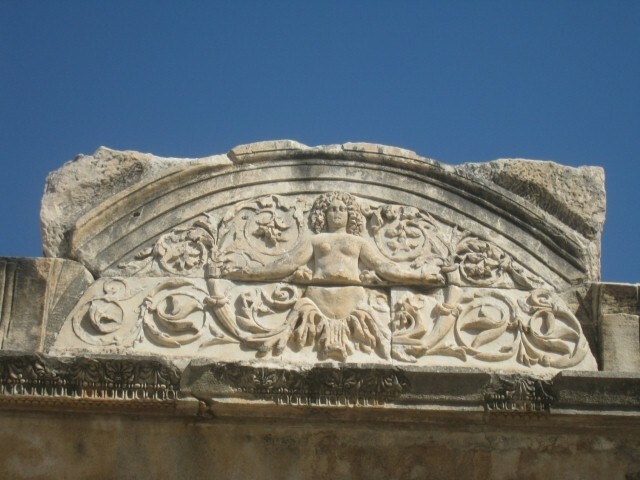 Promoters of Ephasus – most likely not scholars – say it is the first advertisement in history, as the images supposedly point the way to the brothel which has an entry from Marble Street. The so-called brothel was dubbed as such, rightly or wrongly, because a fertility statue with an oversize phallus was discovered inside the building. The Octagon is an eight-sided vaulted burial chamber holding a young female skeleton in a marble sarcophagus – unusual because Ephesus citizens were not allowed to build tombs in the city center. The body is reputed to belong to Arsinoe IV, the youngest sister and rival of Cleopatra of Egypt. It is not clear whether Arsinoe fled Egypt or was exiled but in either event she sought sanctuary in the Temple of Artemis which offered immunity to all fugitives. At Cleopatra’s instigation, Marc Antony ordered Arsinoe executed which prompts some to hypothesize that Ephesus’s solitary city-center tomb was built to whitewash her murder. By closing time around 5:00 pm (off season hours) the guards were scooting everybody towards the two exit gates. Cat and I made our way back to the Magnesian Gate extremely content with how we managed to maximize our time at Ephesus. We stopped at the booth to return our rented audio cassette, but we didn’t see anyone inside. Finally we peeked through the window and for the first time since we landed in Turkey eight days earlier we spied a Moslem on a floor mat in prayer. If it were 5,000 years earlier he would have been kneeling to Artemis.